Have you ever noticed that when you flush your toilet the water spirals down in a counter clockwise fashion? Your high school science teacher may have told you that the Coriolis Force was responsible for this effect, and although that’s correct in principle it’s debatable on such a small scale as a toilet bowl. Where it’s not debatable though is on a large scale such as a lake like Winnebago or any of the Great Lakes. I’d like to take a few minutes to explain how the Coriolis Force can affect the currents in large lakes that you like to fish, and how those currents can affect your fishing success. The Coriolis Force, in a nutshell, is the motion which can be imparted on fluids (air or water) which are in contact with the spinning Earth. In the Northern Hemisphere this rotation is counterclockwise and in the Southern Hemisphere it is clockwise. So unless they’ve been planting walleyes somewhere in Australia that I haven’t heard about, I’ll concentrate on the counter clock-wise rotation that we see north of the equator. If you look at a lake on a map, you can bet that the dominant current in that lake flows in a counter-clockwise direction. The strength of that current will vary from lake to lake, with larger lakes having a stronger current, but there will be some movement of water around the perimeter of that body of water. The closer you get to the center of the lake, the less pronounced the current is. I saw a clear example of this effect on Lake Erie this summer while fishing out of Cleveland. There was a moderate wind blowing and I was driving from the harbor straight out to the Canadian border to fish. The waves were about 4’ near shore and it looked like it was going to be a long rough trip, but the farther out I got the smaller the waves got. The wind was out of the east and it hadn’t let up any when I got offshore, but the waves had certainly died down. The reason, I realized, was that the currents near shore were causing the waves to build and as I got out farther the current had decreased and so did the wave heights. 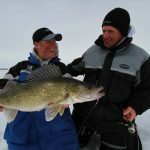 I believe that the current in a lake has two major applications to walleye fishing that can help you to understand where fish might be, and why they might be there. If you think of the way that fish use structure in a river situation, and then expand that thinking to a much greater scale you can start to visualize the way that a point extending from shore on a lake will concentrate current on it’s tip or the way that a sharp breaking shoreline will have more current along it than a slow breaking shallow flat. While the currents in lakes are much less intense than you’ll see in rivers, the same principles of fish location in rivers can be applied on a larger scale. Some predator fish in lakes may stay put in areas that they have learned are places that the lake currents will constantly be channeling food past them, while other fish may be conditioned to use that current to help them travel to new areas in search of food. I have noticed that the post spawn migration of fish is also typically counter clock-wise in lakes, which makes sense if you think in terms of energy conservation. If you were a female walleye who needed to replenish the energy spent spawning, you’d be more likely to swim along with the current than against it when searching for food sources. Winnebago and Erie are both good examples of the seasonal migration of the big walleye schools from their spawning grounds moving slowly around counter clock-wise as the summer progresses. Resevoirs don’t have the counter clock-wise current of lakes, but they too see walleyes moving downstream all summer after the spawn. Have you ever noticed that whatever depth you’re fishing in, the fish on your graph all seem to be halfway down to the bottom? Do the fish know how deep it is and just feel like splitting the difference? I doubt it. In a current situation the flow is greatest half way down to the bottom. The friction created by the air surface and the bottom of the river or lake is enough to impede the flow of water, and the middle of that water column has the least resistance to the flow and consequently the greatest velocity of current. Fish holding at this depth are probably taking advantage of the current in some way. Great Lakes salmon fisherman have been aware of the importance of currents and how they effect their fishing for a long time. When walleye fishing in open water it’s a good idea to keep in mind some of the lessons that the salmon guys have learned. Salmon fishermen are constantly aware of the line angle of their downrigger cables, or better yet have speed indicators on their downrigger balls. The current at your baits may be different than what you see or don’t see on the surface, and it effects the action of your baits. Going against the current will increase the action of your lures, while going with the current can deaden the action of your bait. It pays to recognize the action that the fish want on any given day and be able to duplicate it. Which means that you may have to go one speed on your GPS against the current, and a faster speed if you turn and begin to go with the current. The flow of water in lakes is very complex and there are many factors which can alter the dominant counter clock-wise flow. Things like wind direction, pressure systems, depth of the thermocline and the structure of the lake can all vary the current direction at any particular location, but realizing that the general direction is counter clock-wise is worth paying attention to and could put a few more fish in your boat.